I write novels that are labeled "Women’s Fiction" within the industry, so I’m always pleased when I hear positive comments from the guys. One of my favorite compliments was when a male sales rep for the publisher of The Forgiving Hour asked me, "How did you get into the minds of Dakota and Kevin? [The two male POV characters in the novel.] They thought and said exactly what I would have." Man, that was great to hear. This novella is the perfect size to read in an evening or two. Recapturing the spirit of Christmas won’t be difficult while reading A Carol for Christmas. Hatcher builds deep characters within a limited number of pages. There is no doubt the reader will connect with at least one of the cast’s characters. 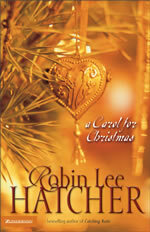 Aside from the use of the obvious "gimmick" of naming one of her leads, Carol, for a catchy title and storyline, I wasn’t disappointed with A Carol for Christmas, my first read of Hatcher’s writing. As I read this novella, I envisioned former American Idol winner, Carrie Underwood, as Carol, if it ever becomes a Hallmark television special. Enter your email address to subscribe to this blog and receive notifications of new posts by email. Be sure to complete the subscription process. Great review for you! Congratulations! Ooooh I haven’t even read the book yet but I love the idea of a movie starring Carrie Underwood. Nice review. I send out a newsletter a few times a year, announcing specials and new releases. When you subscribe, you will be provided a link to a free copy of my short story, The Huckleberry Patch. I hope you enjoy it. Be the first to know when my next book is available! Click the red button above to get an alert whenever I have a new release, preorder, or discount! Many photos and graphics on site have been licensed through Adobe Stock, Dollar Photo Club, and Storyblocks.